Want to learn how to configure and run Kamailio – the Open Source SIP Server? We are happy to inform you about a public training class together with our friends in Avanzada 7 – February 20-23, 2017! Teacher is Olle E. Johansson, active Kamailio developer, Asterisk developer and active in the SIP Forum and the IETF. 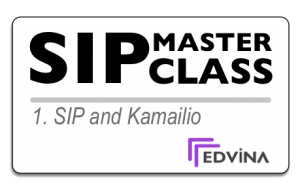 The Edvina SIP Masterclass part 1 covers a lot of topics and have a well-proven set of labs to gradually teach you how to operate Kamailio. This class is four days of labs and tutorials. We’re going to go through SIP, which is essential for operating Kamailio, RTP, NAT and much more. SIP over WebSockets with WebRTC is a natural part of the class. The price is 2.500 Euro ex VAT for four days. If you hurry up and register before the 20th of January you’ll get the Early Bird price of 2.000 Euro ex VAT – a low price for a training with Olle. Contact us today at info@edvina.net to register!